There is a growing trend of marijuana edibles available in the market due to recent legislation activities in some U.S. states and cities. From infused drinks to connoisseur chocolates, cannabutter muffins and assorted soup recipes, cannabis edibles have a whole lot to offer its users. Consumers of both medicinal and recreational marijuana use it to alleviate pain and anxiety, stimulate appetite, and manage symptoms of a host of diseases. Some stoners even use it to kill their cravings for alcohol and tobacco. The issue of self-regulating markets that lack universal standards in labeling and size recommendations, however, poses a challenge for people who love cannabis infused treats. The central government is taking its time on creating the best policies that would regulate the sale and consumption of cannabis edibles in a legalized market place. People who have experienced uncomfortable moments with these irresistible goodies apply caution while consuming it. It is important to be able to consume cannabis edibles without the fear of getting a ‘high’ or feeling a ‘buzz’ they can’t handle. What are your reasons for wanting to consume that good-looking, well labeled infused chocolate bar? If hunger, anger, boredom, and distraction are any of those reasons, then you may not be getting desirable results from eating it. For most people, cannabis compounds like THC intensify emotions and when it kicks in, it kicks hard. Let your reasons for consuming cannabis edibles be positive. Eat them while you feel like you want to relax or have a good time with friends. Generally, it is advisable to always try out new edibles during bed time or when you’ve cleared your schedule for the day. This helps you figure out how your metabolism process each of these goodies and how you can get the best out of your edibles. If a few milligrams of THC or CBD can give you the right buzz or feeling, it is better to stick with that. Some edible cookies can have THC strength up to 1,000 milligrams. If you are not a seasoned marijuana consumer or your tolerance is not that high, do not attempt to consume. The way the body processes smoked marijuana is different from the how it does infused foods. For the latter, it may take a while before it kicks in. Besides, each individual is wired differently and it has diverse effects on each person, depending on a number of factors. 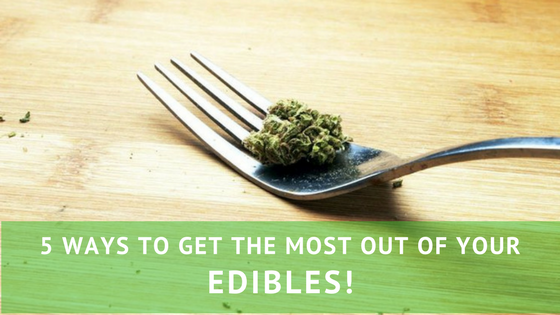 The best way to tone down any adverse effects of edibles and have the best experience possible when trying a new product is to start low and go quite slow. Cannabinoids and terpenes are numbered in hundreds in cannabis plants. These compounds work synergistically to amplify the effects of each other when consumed, to create a greater impact on the mind and body. Before consuming an edible, try and establish if it was made from a whole plant extract or from a CBD isolate extraction. Knowing your limits and understanding the way commonly used cannabis compounds interact with your body will go a long way in helping you get the best out of your edibles. We all know some cannabis-infused delicacies contain a high level of THC and a lot of sugar as well. While having intentions to consume edibles because of its health benefits, putting your health at risk at the same time is not logical. Avoid taking cannabis-infused snacks that has a lot of sugar and artificial preservatives. Eating low-sugar or sugar-free edibles is healthy. Do not eat edibles with a lot of artificial ingredients and preservatives. Avoid being in a situation where there are plenty physical activities going on when eating your edibles. It is better to stay close to home and not intending to go to distant places. Above all, always consume on a filled stomach. Usually, cannabis edibles induce “the relaxation effect” and chances are you don’t want to go anywhere or do anything else after eating it. When you eat a decent meal, the active compounds are absorbed at a relatively slower and steadier rate and it is less likely to feel overwhelmed by the onset of the THC. Scientific research also supports that eating beforehand may increase the bioavailability of both the THC and CBD. This suggests there is a greater chance of maximizing the health benefits of cannabis when consumed after food. Many edible products are delicious, no doubt. It can be quite challenging to eat just the portion that’s your normal dosage. You must be able to resist the urge to eat more because that “one more bite” could be the difference between an amazing experience and an awkward one.